DrinkBox Studio's Guacamelee is allegedly set to come to the PS4 and Xbox One with additional content. 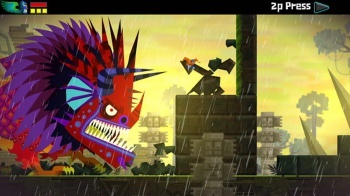 In a report by IGN, it states that DrinkBox Studio's Guacamelee will be coming to the PlayStation 4 and Xbox One in Spring of 2014. The post, which has since been pulled, also mentions that the PS4 and Xbox One versions will have additional content in the form of two new worlds, new enemies, a "chicken-bomb" ability and enhanced visuals and particle effects to take advantage of the new consoles' horsepower. When asked for a comment, a DrinkBox Studio rep has given out a rather cheeky "What's Guacamelee?" response. Released in April 2013 for the PlayStation 3, PlayStation Vita and Windows, Guacamelee is a 2D puzzle platform game that has you playing a luchadore named, Juan Aguacate. The story itself draws inspiration from Mexican folklore and has the player swap between two dimensions on your quest to rescue Aguacate's girl. You can read our review of Guacamelee where The Escapist called it "Absolute brilliance that falls just short of perfection."